Drum Circle Benefits! It is well-known that playing a musical instrument can help develop mental competency and motor skills as well as provide other intangible benefits to the player (and the listener). 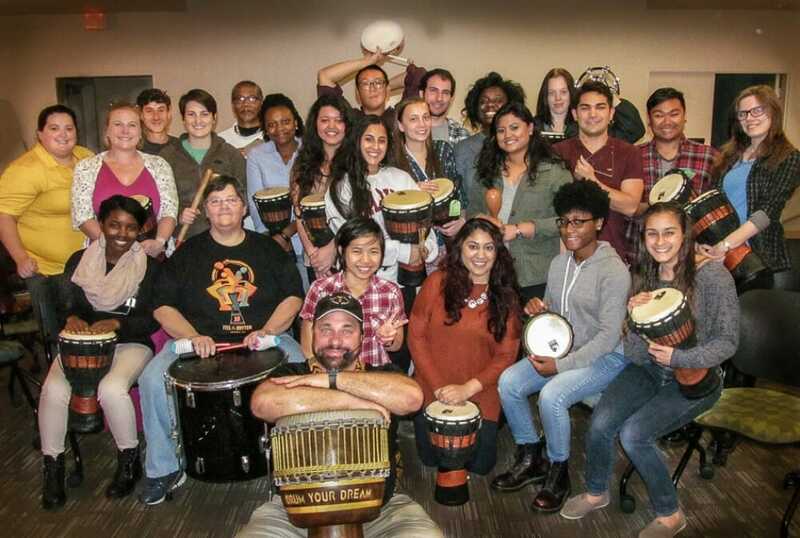 It is also widely documented that the unique rhythmic and social aspects of a Drum Circle can produce a broad range of benefits among participants. These benefits are considered important elements in the physical, psychological and social developmental dimensions of a healthy and well-adjusted individual. Best of all, a Drum Circle is accessible and beneficial to absolutely anyone regardless of age, ability or personality type. – It’s suitable for anyone regardless of age or musical abilities. – Promotes effective interaction and cooperation among group members – Promotes bonding as a group and a sense of individual belonging and purpose – Simultaneously stimulates both right and left brain activity which is associated with creative or “out of the box” thinking – Develops clear communication skills by encouraging the mutual exchange of ideas – The “Soloing” role provides a safe and supportive environment for creative expression – The “Supporting” role demonstrates the uplifting power of allowing others to shine – Both of these “roles” promote a give-and-take balance between listening and speaking which is required for effective conversation and relationships. – The sound of one drum in the circle demonstrates the profound effect of the individual on the larger group. Drum Your Dream at Riverside Pace Community Senior Center in Richmond VA.
“Arthur, The residents loved today’s interactive presentation…..I have to make sure I scheduled you again and again and again. You were absolutely wonderful.” Tina Thomas, Activities Director of Williamsburg Landing. Participating in a Drum Circle helps develop confidence which benefits all types of human interaction from one-on-one to public speaking It’s a celebration of life capable of breaking down all of societies barriers: age, gender, culture, religion, language -Places the participant squarely in the here-and-now, which suppresses feelings of regret about the past or anxiety about the future and allows the individual to enjoy life in the moment – Promotes deep breathing and cardiovascular health – Releases stress and subsides anger – Revitalizes and energizes in a healthy and uplifting way – Sparks a general feeling of well-being – It’s just plain fun! Available for out of state Drum Circles fill the Contact info form for your request.